Our outdoor Pavilion provides breathtaking views of our Estate vineyards, rose garden and the lake. Enjoy a casual lunch showcasing delicious local and seasonal ingredients paired with our iconic wines. Our outdoor restaurant is now closed for the season. Check back for the completion of our new year round venue in the new year! under construction, please use the parking lot as indicated by signage upon arrival. Our concierge team will greet you and assist with parking and access. Micheal made us fell totally welcome. Best wishes for the new restaurant in the new year. We have gone many times in the past years, with only lunch being served this year we have enjoyed the pavilion and a very different ambiance, it always feels comfortable and relaxing. Love the view though unfortunately it has been very smoky this year. We enjoy the versatility of the menus and I have again been impressed with the flavour full dishes. The service was outstanding and the knowledge about wine and the pairing with food likewise. Hoping to come again next week. My mother was visiting from out of town and I brought her to Cedar Creek for lunch. She was thrilled with the delicious local food and wine and with the spectacular (if slightly smoky) view. The service was also phenomenal. This is the Okanagan at its finest! This was a fabulous choice for a special occasion. Although getting to the restaurant was a bit tricky because of the construction, it was just a lovely afternoon. The charcuterie was fabulous, the wines delightful and the food very tasty. We all had dessert and our granddaughter picked the wine to pair with it . .. it was a lovely Pinot Noir. Would definitely go again . .. the view is lovely. Enjoyed a terrific lunch in the pagoda. Salmon was delicious! Service was superb. The restaurant is in a temporary space at the moment, awaiting new digs which are in progress - but I thought it was just stunning - an outdoor comfortable space, breezes, views, nice music, -- and the food was really excellent. The service was attentive and knowledgeable, with just the right amount of personality. An excellent spot to spend an hour or so! Hope to come back soon. Amazing location with delicious food, wine and friendly service. The charcuterie was so good! Very friendly staff, beautiful environment and excellent food. The food was bar none ...we had a trout salad that was my favourite meal from all the wineries in the area. A woman named Wendy was our server and she was remarkable with our children and as a server. She was exceptionally informed also about the wines which helped us in our purchase of bottles after. Cedar Creek really stood out in terms of culinary quality and service. The winery is undergoing a complete renovation/rebuild so although the view from outdoor dining area of the Terrace Restaurant was lovely, the constant sound of construction was not. I would wait until the Reno’s are completed...spring of 2019! Great location, outstanding service, and the food was fantastic. Service was exceptional as was the food and the wine. A beautiful setting. We are so lucky to live close by! Very pleased to have a year round restaurant to look forward to. 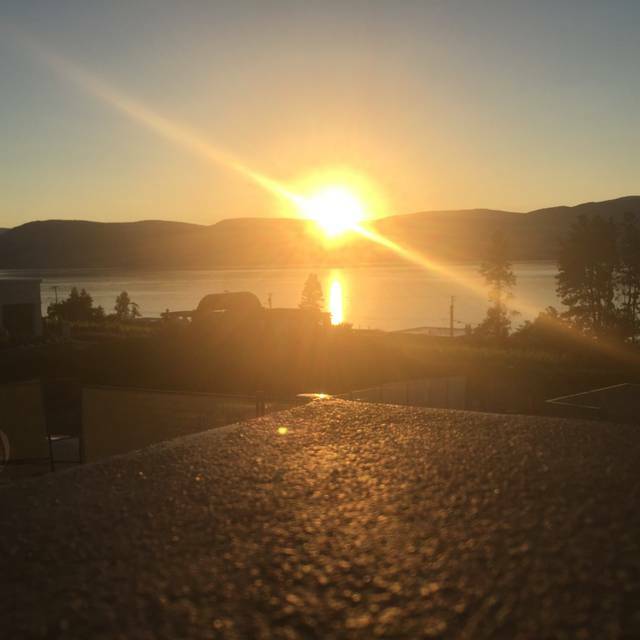 I was flying out to meet my husband for his short layover in Kelowna, and I thought lunch or dinner at a winery would be a perfect way to pass some time. Cedar Creek had excellent reviews and an open reservation that worked for timing, so I booked it. The view is spectacular. It’s a covered terrace, with just amazing views out over the hillside and the lake. The new restaurant is under construction so the walk to the terrace was a bit sketchy in my heels, but no construction was happening during our lunch (the server mentioned that the restaurant will be all season, but for now they are just doing lunch on the terrace until it’s complete). We were a bit early, so we sat under the pergola with a glass of wine until the table was ready. What a great place to wait! Again, views are incredible. The menu is simple, which I greatly prefer because it makes choosing easy. Everything was sublime. We had the chef’s charcuterie board, followed by the pasta and the shrimp. It all paired beautifully with the bottle of Chardonnay, and the portions were perfect for sharing. Our server was friendly, attentive but discreet. We finished up with the tiramisu and coffee, and it was a lovely way to end our date. We also closed out the restaurant, and the staff was careful not to rush us, and did their after work prep quietly and unobtrusively. We would both highly recommend Cedar Creek! We had no idea about the construction had to park a long way away and a couple of friends had to go home as they could not navigate the walk to the restaurant, which was very unfortunate- this info should be on Open table as lots of people were struggling. Great staff and view, despite the construction. Wonderful coffee! Was disappointed didn't have chocolate cardamom cake for dessert, but tried delicious chocolate mousse. Limited options on menu, but enjoyed the seared tuna. 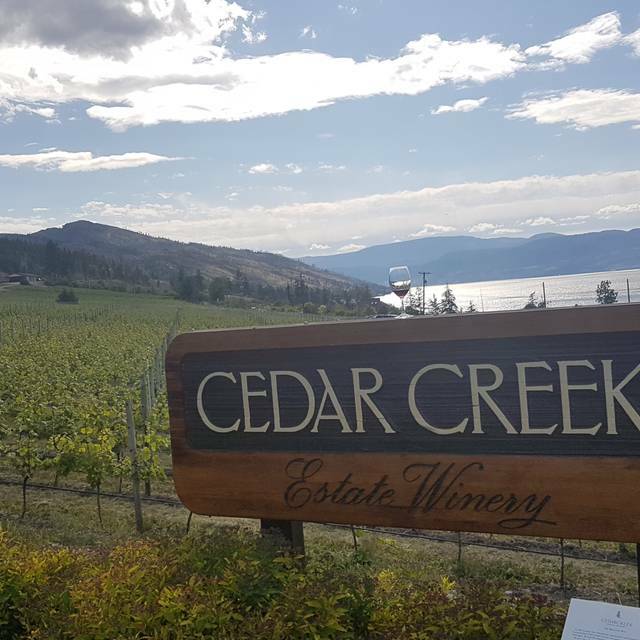 Cedar Creek provides a beautiful view, good food, a peaceful ambiance despite the construction, and always, great white wines at a competitive price. We went for a Father’s Day lunch. The ambience was great and the location was beautiful. The staff were great and very accommodating and helpful. The food was good and reasonably priced but we found the menu very limited. In spite of a very limited menu, we enjoyed a quiet lunch in the Pavilion overlooking the Lake. Service was excellent and we look forward to returning when construction of their year round restaurant opens next year. The best burger I’ve aver had! Great atmosphere and service. Loved the food, the construction obstructed the view ( not a deal breaker but would have been nice to know ahead of time). Short but interesting lunch menu. We had soup and two different courses. All were delicious. Price was reasonable. Will be coming back. A wonderful, casual afternoon spent with good friends. Excellent service, great food, very pleasant ambience. If you happen to be looking for a place to have a tasty affordable lunch, where you can hear your friend(s) chatting with you, this is it! And, an awesome view of the lake and valley. Most enjoyable. We are looking forward to next time. Thanks for the terrific service. Food and service were excellent. Our waiter was fun and very helpful when choosing a wine to accompany our lunch entree. Would not hesitate to recommend the patio for lunch. Absolutely outstanding food and service - one of my favourite spots when visiting Kelowna. this is our local winery/terrace dining. we LOVE it. low keyed relaxed atmosphere but top notch wines and killer menu. they support local growers of everything. LOVE LOVE LOVE our cedar creek! we are platinum members so get wine deliveries seasonally and news of special events at the vineyard. we LOVE the pick up parties (not what you think!) and vineyard tours , learning about the property and all things wine making, and the tastings and food pairings. Cedar creek is unpretentious and fabulous. what a combo. 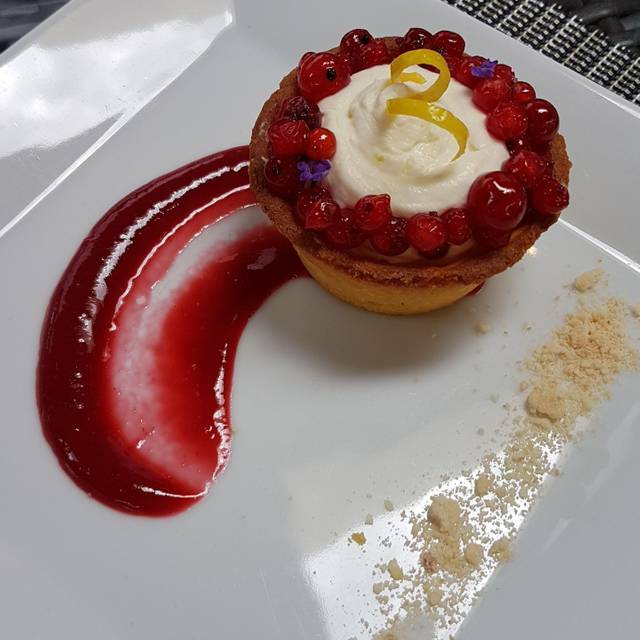 Wonderful food, prepared thoughtfully and presented artfully. The server, Brendan, was knowledgeable, mannerly, and respectful. The time, thought, and care from kitchen to table is noteworthy and appreciated. As always, lunch was perfection. The tuna salad was lovely, first time I have tried it and will order the same again. This is a fabulous restaurant that never disappoints. We had an excellent meal and it was a lovely experience. My husband and I went for our anniversary. While I did not find many choices on the menu I was interested in- the salad and side of veggies were delish. One table brought a dog to supper while a mother at another table was breast feeding. While I respect other people's choices they really weren't sights I was expecting to see for a fine dining experience. We visited for both wine tasting (and buying!) as well as lunch with the kids (10, 12). The kids loved the kids menu, my wife was a bit disappointed with the ling cod. 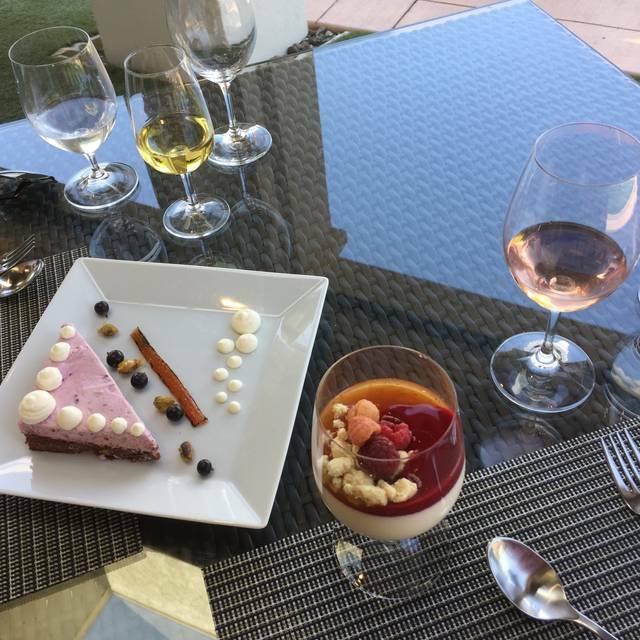 The deserts (chocolate mousse and vanilla yogurt panna cotta) were the treat of the day! The on site construction was no problem, as they were not working on a Saturday. Fantastic everything!!! It was a wonderful date night! !